In The River Was Dyed with Blood, best-selling Forrest biographer Brian Steel Wills argues that although atrocities did occur after the fall of the fort, Forrest did not order or intend a systematic execution of its defenders. Rather, the general’s great failing was losing control of his troops. A prewar slave trader and owner, Forrest was a controversial figure throughout his lifetime. Because the attack on Fort Pillow—which, as Forrest wrote, left the nearby waters “dyed with blood”—occurred in an election year, Republicans used him as a convenient Confederate scapegoat to marshal support for the war. After the war he also became closely associated with the spread of the Ku Klux Klan. 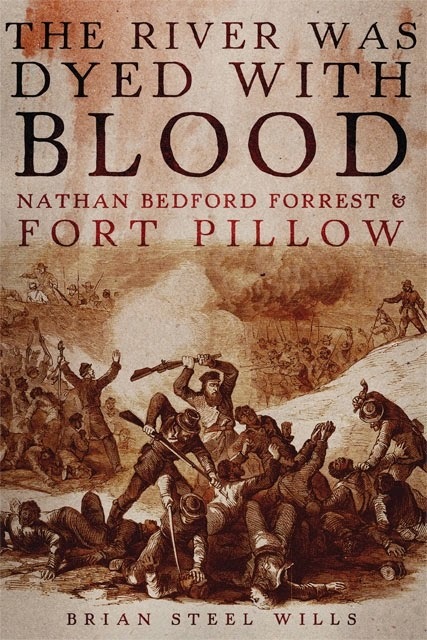 Consequently, the man himself, and the truth about Fort Pillow, has remained buried beneath myths, legends, popular depictions, and disputes about the events themselves. Wills sets what took place at Fort Pillow in the context of other wartime excesses from the American Revolution to World War II and Vietnam, as well as the cultural transformations brought on by the Civil War. Confederates viewed black Union soldiers as the embodiment of slave rebellion and reacted accordingly. Nevertheless, Wills concludes that the engagement was neither a massacre carried out deliberately by Forrest, as charged by a congressional committee, nor solely a northern fabrication meant to discredit him and the Confederate States of America, as pro-Southern apologists have suggested. The battle-scarred fighter with his homespun aphorisms was neither an infallible warrior nor a heartless butcher, but a product of his time and his heritage. Blurb: "Readers of Brian Steel Wills's biography of Nathan Bedford Forrest, A Battle From The Start, know the quality of his work. Wills now gives us the most comprehensive, dispassionate, and objective look wer are likely to get of Fo rrest's most controversial momnet---those awful minutes at Fort Pillow, Tennessee, when warfare briefly became butcher. The River Was Dyed With Blood must become our safest guide through the murky terrain that separates soldiery frrom savagery, and how participants and posterity choose to remember moments many would rather forget." William C. Davis, author of Fighting Men of the Civil War among others. Excerpt: What did the Civil War’s death toll mean to those who lived through it? We are now told that wartime deaths were unprecedented and overwhelming, and constituted one of the fundamental experiences for the wartime generation. But is this really true? Full Text of Article at New York Times, April 15, 2014. Evidence for the extraordinary importance of affliction in the lives of antebellum Americans may be found in nearly any historical source from the period. Newspapers almost always included both poems about the death of loved ones and advertisements for nostrums claiming to cure a variety of ailments. Health became an important focus of advice manuals, and fiction frequently made use of death and sickness as plot devices. In many cases, private correspondence concerned matters of health to the exclusion of most other topics, and diaries overflowed withdescriptions of suffering. Given these circumstances, it is important to remember that approximately two-thirds of the deaths of soldiers came as a result of disease, rather than on the battlefield. Looking back from today, these numbers are difficult to fathom, and the image conjured by them is of horrendously unsanitary conditions in military camps. After all, these deathsseem to be as much a product of war as those that resulted from wounds: soldiers in camp were there to fight the war and they died because the conditions were necessary to conduct field operations with a massive army. The experience with epidemic sickness and death in other historical moments should also remind us that Americans have been much more blasé about death from sickness than they are today. During the global flu epidemic at the end of World War I as many as 100 million worldwide, including 600,000 in the United States (roughly five times the number of American casualties in World War I and approaching the total number of deaths in the Civil War), perished over the course of just a few months. In addition, this was an unusual strain of influenza that killed mainly the healthiest cohort of the population (those in their 20s and 30s) through a violent immune response. If any event should have triggered re-evaluation of the nation’s approach to death (based solely on changes in incidence and scale, as Civil War historians often calculate), this would be it. This is not to say that deaths in the war were not emotionally wrenching, or that they did not raise any number of new issues for Americans. The antebellum evidence shows that within a sentimentalized culture, death was indeedan important and profoundly disturbing event. Deaths in the war were also viewed in this way, and the trauma associated with them was real, heartfelt and an added burden. - See more at: http://hnn.us/article/155305#sthash.rlbC0sWN.dpufWhat did the Civil War’s death toll mean to those who lived through it? We are now told that wartime deaths were unprecedented and overwhelming, and constituted one of the fundamental experiences for the wartime generation. But is this really true? Given these circumstances, it is important to remember that approximately two-thirds of the deaths of soldiers came as a result of disease, rather than on the battlefield. Looking back from today, these numbers are difficult to fathom, and the image conjured by them is of horrendously unsanitary conditions in military camps. After all, these deaths seem to be as much a product of war as those that resulted from wounds: soldiers in camp were there to fight the war and they died because the conditions were necessary to conduct field operations with a massive army. What did the Civil War’s death toll mean to those who lived through it? We are now told that wartime deaths were unprecedented and overwhelming, and constituted one of the fundamental experiences for the wartime generation. But is this really true? 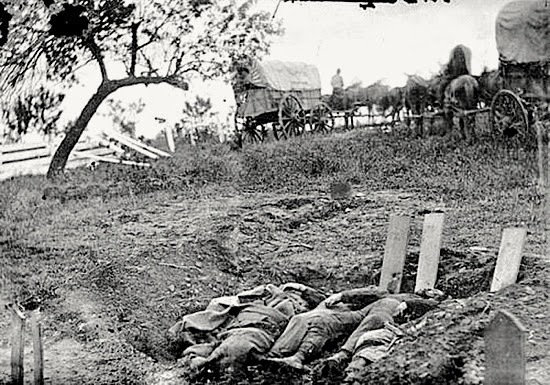 One such statistic is that the number of soldiers’ deaths in the Civil War – approximately 750,000 – was greater than the total number suffered in all other American wars combined. A second point makes use of the first figure: If one calculates the proportion of the total population who died while in military service during the war, and applies this percentage to present-day population figures, the equivalent number of deaths in the 21st century would reach above 7 million. This is a staggering figure that suggests that the Civil War generation made almost inconceivable sacrifices.What did the Civil War’s death toll mean to those who lived through it? We are now told that wartime deaths were unprecedented and overwhelming, and constituted one of the fundamental experiences for the wartime generation. But is this really true? This all should be up on the site soon, but for the time being, hers the rough schedule of events for the Muster, which is scheduled for Friday, June 6, Saturday June 7 and Sunday, June 8. Friday: (3:00 pm) John Rudy will lead a town tour based on the? ?conditions in Gettysburg one year after the battle. At the annual meeting/cocktail hour, Goerge Franks will offer a presentation on his book on the Battle Of Falling Waters. Saturday; (8:30 am) Chuck Teague has offered two choices:?Wrights Brigade on? July 2 or the or the Union Defense?of Cemetery Ridge at the same time.? I'm torn.? Entrance door on the right side. Construction: One wall with one door. Manassas: A Battlefield Guide, Ethan Rafuse, author; Erin Greb, cartographer; University of Nebraska Press, 232 pp, 47 maps, 2 appendices, $21.95. [May 2014]. This volume is the essential guide to the Manassas battlefields, site of two of the Civil War’s critical campaigns. Ethan S. Rafuse, a distinguished scholar of the Civil War, provides a clearly organized, thorough, and uniquely insightful account of both campaigns, along with expert analysis and precise directions for armchair traveler and battlefield visitor alike. The July 1861 Battle of First Manassas and the August 1862 Battle of Second Manassas unequivocally influenced the course and outcome of the Civil War. The first battle dealt a decisive blow to hopes that the inexperienced armies of the North and the South could bring about a quick military resolution of the secession crisis. The second battle was the climactic engagement of a spectacular campaign that carried the war to the outskirts of Washington DC and marked the coming of age of Robert E. Lee’s Army of Northern Virginia. Manassas: A Battlefield Guide presents readers with a clear, convenient guide to the sites in northern and central Virginia that shaped the course and outcome of these campaigns. Lucid, concise narratives give readers a better understanding of the events that took place on these battlefields and of the terrain, personalities, and decisions that shaped them. 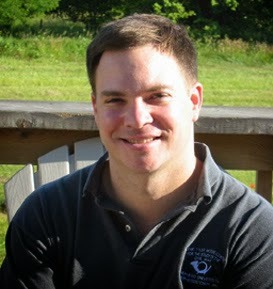 Ethan S. Rafuse is a professor of history at the U.S. Army Command and General Staff College and has led staff rides and tours of historic battlefields for many military and civilian groups. He is also the author of several books, including Antietam, South Mountain, and Harpers Ferry: A Battlefield Guide (Nebraska, 2008) and McClellan’s War: The Failure of Moderation in the Struggle for the Union. CWL: Manassas: A Battlefield Guide is fifth volume in the This Hallowed Ground: Guides to Civil War Battlefields edited by Brooks D. Simpson, Mark Grimsley and Steven E. Woodworth. Other volumes in the series include guides for 1] Antietam, South Mountain and Harpers Ferry, 2] Gettysburg, 3] Chickamauga and 4] Wilson's Creek, Pea Ridge and Prairie, Grove. CWL owns and frequently uses 1], 2] and 3]. These books are dashboard friendly for driving tours and readable at home. Both the maps and the narrative are clear, concise and cogent. Lower Image is of the author, Ethan Rafuse. The Civil War In Popular Culture: Memory And Meaning, Lawrence A. Kreiser and Randal Allred, editors, University of Kentucky Press, 257 pages, bibliographic notes, index, $40.00. The eleven essays, introduction and afterward offered in The Civil War In Popular Culture: Memory And Meaning are each scholarly, informative and entertaining. The perspectives and focus of the fourteen authors' essays are both broad and unique. A casual bookstore browser may think that it is another book about reenactors for reenactors but that would certainly be a mistaken impression. The essays chosen and edited by Kreiser and Allred are compelling for the questions they address. What do we know of how Civil War veterans came to psychological terms with the aftereffects of killing? Where Confederate amputees viewed as whole men who could be married? What value did veterans and early visitors to Chickamauga battlefield park during 1890s place on relics they found there? If 80% of all Americans receive no historical training beyond high school, then what success can the Gettysburg National Military Park have in placing slavery into the battle and its legacy? Is the Civil Preservation Trust's rebranding itself as the Civil War Trust, its investment in Internet web pages and mobile phone applications eliminating actual visits to the battlefields that the foundation has preserved? What does the history of Civil War board games tell us about what the popular culture views as entertainment and hobby? Have Lincoln movies homogenized the president who confessed his own childhood was among the simple annals of the poor? Has Lincoln the lawyer become both a vampire slayer and a pragmatic emancipator in the popular mind? Does the film Glory offer an honest depiction of Civil War combat? There is indeed one essay on reenactors. How do today's Good Ol' Rebel reenactors understand racism, slavery and their Lost Cause? Clear, concise and cogent, the essays are both incisive for the scholar and accessible to the general reader. The bibliographic notes appear at the conclusion of each essay and encourage readers and graduate student to realize the dynamic nature of the field pursue new avenues of research in popular culture. A Different Kind of Civil War Memorial, Dennis Montagna, The Wall Street Journal, March 30-31, 2014. The opening credits of "House of Cards," the new Netflix-produced political thriller, are set against time-lapse views of Washington that include the Capitol and the Kennedy Center. 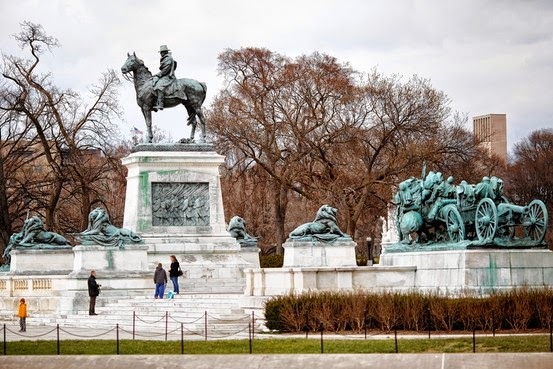 Yet the most prominently featured landmark, the Ulysses S. Grant Memorial, is likely to be less familiar to most viewers. Honoring a hero and symbolizing the nation's new prominence on the world stage at the dawn of the 20th century. Its relative obscurity today is unfortunate, because this monument is one of the greatest works of commemorative art this country has produced. More than a monument, it is a symbol both of Washington's aspirations as a city at the dawn of the 20th century and of the nation's increasing prominence at that same moment. More than 250 feet wide and 70 feet deep, the memorial sits at the foot of the Capitol. An expansive reflecting pool fans out before it, with the National Mall beyond. At the center of a broad stepped marble plaza, a bronze portrait of Grant stands atop a tall marble pedestal. Four recumbent lions flank the statue, while low-relief panels on the pedestal's sides depict marching infantrymen. On either side but at some remove are two massive bronze sculptural groups, one depicting a cavalry charge, the other a field artillery unit wheeling into battle position. After his death in 1885, Union veterans who had served under Grant campaigned for a monument to be erected in Washington. Their efforts led to Congress appropriating $250,000 in 1901, at that time an unprecedented sum for a federally funded monument. The following year, the three-member Grant Memorial Commission selected New York sculptor Henry Merwin Shrady from a field of 27 candidates, most with far more experience in the realm of public sculpture. The memorial would become his life's work. He spent 20 years on it and died at the age of 52, just weeks before its dedication in 1922. But if you're going to leave only one masterwork, you could do a lot worse than this one. The visitor who takes the trouble to seek it out is rewarded for the effort. The project's ample budget allowed for a more complex memorial than the standard general-on-horseback. The massive cavalry and artillery groups are placed on low pedestals complemented by built-in seating. They provide a portrait of men and horses gripped by war's hardship and carnage seldom seen in earlier memorials. In the former, a cavalry captain leads the charge with sword upraised. The soldier beside him, a self-portrait of the sculptor, tumbles headlong over the mount that has been shot from beneath him. The rider behind shields his eyes with his forearm. Across the plaza, Shrady presents another scene of struggle and endurance. Traversing rough and muddy terrain, a field artillery unit, pulled by a four-horse team, comes to a halt. The horses strain; one breaks free from his reins and presses forward. With expressions ranging from pain to stoicism, three soldiers ride atop the caisson gripping whatever they can for support and bracing themselves against one another. Shrady presented Grant much as had other sculptors, as a brooding, taciturn leader astride a horse that is both still and alert. But his portrayal of soldiers at war creates a powerful counterpoint. Grant is the calm center overseeing the maelstrom of battle. In this way Shrady memorialized not only the leader, but his troops and the relationship that existed between them. Shrady's presentation of troops under duress introduced a thematic tone that set it apart from nearly every earlier Northern monument. The earliest major Civil War monuments, built in the decade after 1865, mourned the dead. Those erected in the 1880s and '90s typically celebrated the Union's triumph. But the Grant Memorial presents the specter of war and sacrifice as ongoing, an idea embraced by many in 1900 as a fact of modern American life. The text of A Different Kind of Civil War Memorial is continued at Wall Street Journal, March 30-13, 2014 . The top photo is by Melissa Golden for the Wall Street Journal. Photograph of lion on the House of Cards opening credits is from Ghosts of Washington D.C.'s article on House of Cards. CWL notes that the "Union veterans who had served under Grant campaigned for a monument to be erected in Washington," were the veterans of the Army Of The Tennessee. The drive to erect a monument to Grant was begun in the 1890s by Society of the Army of the Tennessee. The Grant Memorial is situated in Union Square and is situated beside the Capitol Reflecting Pool. The marble platform for the monument is 252 feet long, 71 feet wide and is divided into three sections. The tall, middle section features a 10,700 pound, 17-foot-2-inch high equestrian statue depicting Grant astride Cincinnati his war horse which rests on on a 22½-foot high marble pedestal. These dimensions are in James M. Goode's The Outdoor Sculpture of Washington, D.C.: A Comprehensive Historical Guide  as cited in the online encyclopedia entry for the U.S. Grant Memorial.